Stoney Creek Reserve - Trentham. Cool country. The North Central Catchment Management Authority, which oversees Stoney Creek and its immediate environs, propogated and supplied over 4000 indigenous trees and grasses and supplied these to the Committee of Management. These plants will complement the Swamp gums and Blackwoods which are already regenerating naturally. The regeneration of the Stoney Creek Reserve is part of a long term vision for Trentham and will form a key part of the hoped for walking and cycling path which will link the existing reserves and provide an 8 kilometre walk around the town. In three years this Reserve will be unrecognisable in comparison to what you see today. The rain eventually stopped and Sunday 14 November dawned bright and sunny. At last the planting which has been in the planning stage for some time, and which had been delayed for more than a month because of the [now] exceptionally wet winter and spring, could start. And start we did. 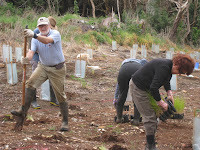 Twenty eight enthusiastic local residents joined forces to plant more than 1500 trees and grasses along the north western edge of the Reserve. Formed into five groups, with each group assigned an area to plant, and each group member either digging holes, planting or putting guards around the trees, work proceeded quickly and it was great to see such endeavour bear results in a short time. Two hours after starting our work was done for the day; 300 trees, primarily Prickly Tea Tree, Prickly Moses and Callistemon and complemented by Silver Wattle, Blackwoods and Swamp Gums were planted, along with 1200 grasses, Lamandra Longifolia, Weeping Grass and Poa Labillieri. All of these plants are indigenous to this Reserve and to Trentham; walk into the Wombat Forest and you can see how they flourish in our unique climate. The planting on Sunday was a really successful community effort and the Committee of Management would like to thank all those who took part. It was good fun; lots of laughter and a BBQ when we had finished helped to make it a day to be remembered. We still have 2500 more trees and grasses to plant and anticipate completing all of this over the next few weeks. The spraying, grooming and mulching of the extensive areas of gorse undertaken at Stoney Creek Reserve over the past eighteen months has been extremely effective and has been the first stage of the regeneration of this native reserve so close to the heart of our town.